After a wonderful weekend in Omaha, we drove over to Kearney, NE, on Monday for our next stop, the University of Nebraska at Kearney. While I did have a few flashbacks to dorm life in the guest dorm room we stayed in, I loved being a few minutes away from all of the events on campus. We ate dinner with the students from Collegians for Integration and Accessibility, and had a wonderful time getting to know them. Several of the girls became Hannah’s (my two year old) best friend while we there. We felt like family even though we’d only been there for a few hours. On Tuesday, it was time to get to work. 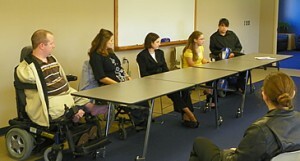 I was invited to be on a panel for students with disabilities, even though it has several years since I was a student. I really enjoyed being on the panel and hearing perspectives from other panel members on what life was like living with their particular disability. I was not even aware of some of the disabilities shared on that panel, and found the afternoon very educational for all involved. I especially appreciated the positive attitude found in the entire room. So often, when disabilities are discussed in any setting, it can be a very negative and/or condescending experience. This was not the case at UNK, and I am glad to have been a part of such an educational experience. Tuesday evening, I got the chance to tell my story and answer some questions from the students. We had a blast together, and I truly hope that my story made a difference and gave the students in attendance some things to think about. For many that were there, I hope that my message of a joy-filled life was either a boost or a reminder to do what they were already doing so well. I appreciate the acceptance and friendships that were formed in the short time we were on campus, and I hope to be back to speak again and meet a whole new set of students in a few years!